Last weekend I had the amazing opportunity to meet and interview Charlie Schmidt, a local artist, designer and all-around creative character. As a self-proclaimed “cat culture enthusiast” and, subsequently, a cat culture blogger here at the Inlander for Cat Friday, it’s astounding to think that one of Schmidt’s most viral creations, the original Keyboard Cat video, is essentially one of the earliest Internet cat memes, and it was made right here, in Spokane. In a story appearing in this week’s issue, previewing next week’s Internet Cat Video Film Festival at the Knitting Factory — at which Schmidt and Keyboard Cat are the featured guests — I explain more about the clip’s history. Out of it all, what’s most interesting is how things lined up so perfectly over decades of time for the video to not only be created — on a whim, as Schmidt and some friends sat around and made goofy videos in a basement — but to survive and still exist today. The main reason he even dusted off that old tape from 1984 was to share with his daughter, Sydney, who’s now 15, some of his earliest creative endeavors, including the infamous footage of Fatso the cat. (As a side note, Schmidt's past and present work is not just limited to cats. Some may recall his “nose dancing” act, which made it onto several late-night shows years ago). Upon realizing the then 20-year-old film was beginning to deteriorate, he went out and purchased digital conversion equipment and software, knowing he just needed to get “one more play” out of all the tapes to be able to preserve their contents. Several years later, a thing on the Interwebs called YouTube was introduced. A friend of Schmidt’s suggested he upload some of the old clips onto the site, so he did, but it took a couple years before Keyboard Cat made it big. Benny, the friendly orange tabby is the modern face of the Keyboard Cat videos and brand. Since then, Schmidt has hired a manager, Ben Lashes, who also happens to be the son of Schmidt's friend and former bandmate in Trailer Park Girls, a local rock band, Doug Clark. Clark is also a columnist for the Spokesman-Review. It was Lashes who encouraged Schmidt to go out and adopt an orange cat to serve as the “reincarnated” Keyboard Cat, since the original star, Fatso, (who was a girl!) passed away several years after the original reel was filmed. Although Schmidt and his wife Joanne already had three other cats (Tuffy, Nato and Buddy Boy), including two orange kitties, none of them were suited for the job of being the modern face of the Keyboard Cat brand. So at the insistence of Lashes, Schmidt got in the car one day, drove to SpokAnimal, and found Bento, the adorable, super-friendly and laid back kitty whose job has made him famous around the world. 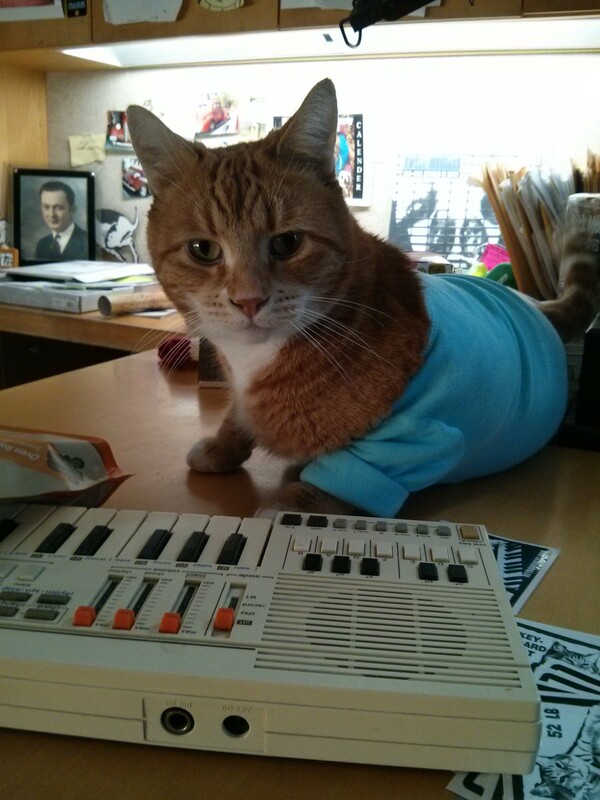 Bento, aka "Benny" or "Benny Boy," is now about 5 1/2 years old, and has been "working" as Keyboard cat since 2010. Schmidt says out of all their cats, Bento, who’s since starred in numerous new Keyboard Cat videos, as well as several national ad campaigns (Wonderful Pistachios and Starburst, to name a few) couldn’t be more perfect for the role as the official Keyboard Cat. See Charlie Schmidt and Bento the Keyboard Cat at next week’s Internet Cat Video Film Fest, on Jan. 16, at the Knitting Factory. Charlie and Bento will be joined on stage with the event's host, Will Braden, a Seattle-based filmmaker and the creator of the viral "Henri, Le Chat Noir" video series. 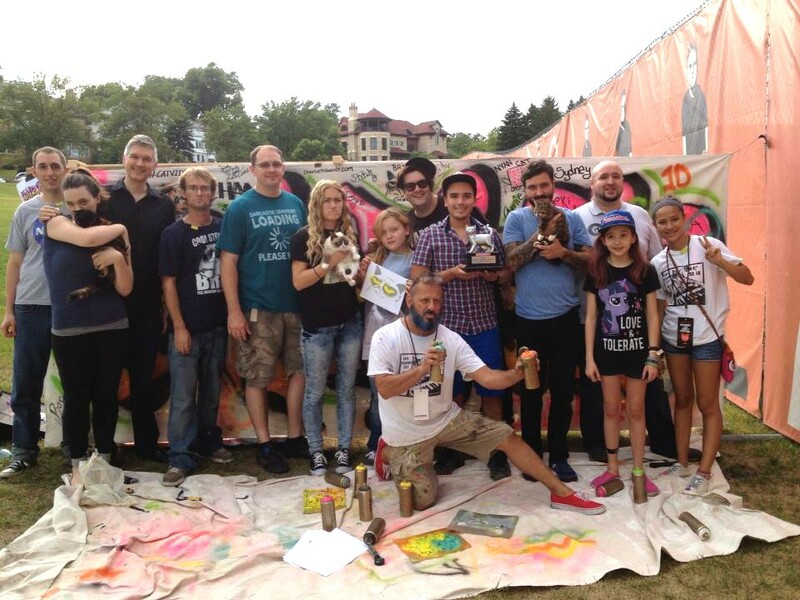 Famous cat owners and cat video creators gathered at the Walker Art Center, in Minneapolis, last August for the 2013 Internet Cat Video Film Festival. There, Keyboard Cat was inducted into the "Internet Cat Video Hall of Fame" along with Nyan Cat and others. Pictured here are Grumpy Cat and her owners, Lil BUB and her Dude, Mike; Nyan Cat's creator Chris Torres, Henri's Will Braden, and in the back center, with sunglasses, famous cat meme manager Ben Lashes. Schmidt is pictured front and center. THIS WEEKEND IN MUSIC: Get out there and listen!